How to be a great EFL teacher? Teaching English language or any other subject can become a boring task especially when we do it routinely. There are some key elements of every teacher’s personality and teaching approach that when combined make you a good teacher. 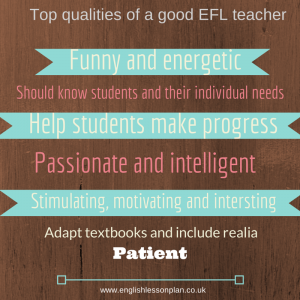 Here are top 7 qualities of a good EFL teacher. 7. Adapt textbooks and include realia when teaching.